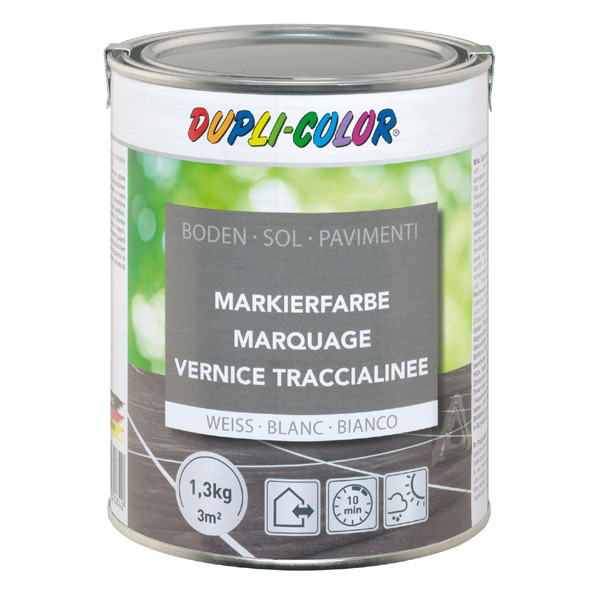 DUPLI-COLOR Floor Marking Paint is a 1K solvent-based Linemarker for new and maintaining markings on streets and parking spaces with average congestion. 6 months if appropriate storage provided (=10°-25°C, relative air humidity of max. 60%) in the unopened original container. The temperature of the air may not be under 5°C and the rel. air humidity must be max. 75 %. The temperature of the substrate has to be at least 3°C over the dew-point may be max. 45°C. All substrates have to be bearing, dry, dust-free and free of oil and fat. On bituminous pavements and concrete there is a direct applicaton possible. Adhesion disturbing components of the surface at new coverings have to be removed by suitable processings. The application on new coverings should take place latest 4 weeks after release of the traffic. For the marking of surface modified or sealed surfaces as well as at special coverings, such as hard concrete or synthetic resin floors on base of EP or PU we recommend the use of a 2-component product from our assortment. 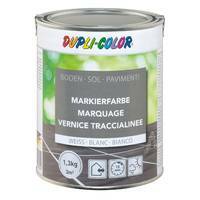 We recommend the same for markings in the interiour. At critical or unknown grounds we recommend a previous test of the adherence.